The program committee welcomes the opportunity to help interested parties shape proposals that connect the program’s theme to our core professional activities. Please do not hesitate to contact the program chairs (Ben Goldman, bmg17@psu.edu, and Kate Hutchens, khutch@umich.edu) with questions or ideas. Proposals involving diverse speakers and experiences will be looked on favorably by the committees. Description of session types are provided below. Seminars and Workshops proposals are evaluated, selected, and coordinated by members of the RBMS Seminars Committee and the RBMS Workshops Committee, respectively. 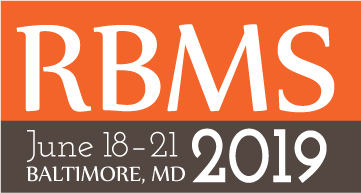 All other sessions are coordinated and selected by members of the RBMS 2019 Conference Program Planning Committee. RBMS will make every effort to accommodate equipment requests, within reason. Deadline for Poster submissions is Friday, November 2, 2018. Notifications of accepted proposals for seminars and workshops will be sent in October, 2018, and other session types in January, 2019. A subsequent call for Pop-Up sessions will be announced in March, 2019. We invite poster proposals that share innovative approaches to issues facing the special collections profession, and especially encourage topics related to the theme (see above). Each submission will be evaluated on the strength of its 300-word abstract and relationship to the conference’s theme or effectiveness in addressing a timely issue. We are especially interested in posters clearly stating a problem and offering practical solutions. Posters are showcased during scheduled times throughout the conference. To provide more flexibility and immediacy to the proceedings, the Program Committee looks forward to soliciting Pop-Up session proposals (similar to the above session types, but expecting less advance planning/formality, echoing those found at the Society of American Archivists annual conference). Additional details will be forthcoming closer to the time of the RBMS 2019 conference.